This post was partly inspired by the The Football Attic blog, an excellent site dedicated to quirky football nostalgia with a particular love of unusual kits. A little while ago the guys set up a knock-out competition to find the best classic sponsor that adorned the shirts of British teams from the 70’s, 80’s and 90’s . The winner was WANG, an American computer company which at one time proudly adorned the Oxford United kit, beating the legendary Newcastle Brown Ale star which was used to striking effect on ‘The Toon’s’ famous black and white striped shirts of the 80’s. As I consoled myself with the defeat of Liverpool’s HITACHI top (featured here in Greatest Kits #1) in the earlier rounds, it got me thinking about another shirt I owned from my past, where the sponsor played a crucial part of the design. Die Continental, who sponsored Borussia Dortmund for just over a decade from 1986 until their European Cup victory in ’97, are a German health Insurance giant. And whilst that might be quite a bland sponsor, the symbol was anything but – and neither were the players who wore it. Matthias Sammer, Andreas Möller, Karl-Heinz Riedle were all some of my favourite German players from the early 90’s, but after Denmark’s shock win at the 1992 European Campionships, I had a special admiration for a talented attacking Dane called Flemming Povlsen. Ally that to the fact that you wouldn’t miss the kit on a poorly lit motorway in the middle of the night, and I couldn’t wait to spend my pocket money. I mean, it’s luminous yellow, how good is that! I remember going into Greaves Sports in Glasgow which was, and probably still is, THE number one place in Scotland to buy football shirts, especially those with a random continental flavour. 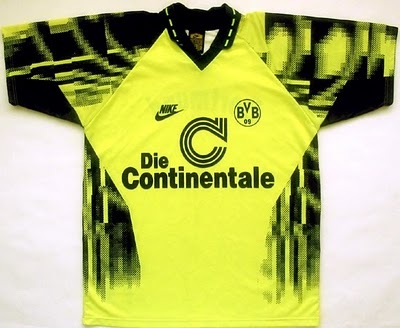 While I was sure that the Dortmund kit was what I was after, I must admit I almost wavered at the last moment. 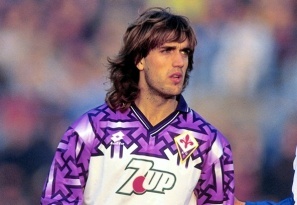 I was nearly seduced by the sultry white and violet silk of Fiorentina away, a top I always wanted to own – Gabriel Batistuta and the rise of Italian football on channel 4 being the main culprits for that obsession. However, I stuck with the plan, and whilst I still regret never owning a ‘Viola’ strip, my BVB shirt is one of my all-time favourites . Over the years Borussia Dortmund have never strayed from their famous bright yellow and black colours, and even though I don’t think the subsequent sponsors have had quite the same visual impact as the big, black C, the club’s colours make the famous ‘Yellow Wall’ inside Signal Iduna Park an amazing spectacle to behold. Jurgen Klopp’s exciting young team are taking Europe by storm and it must be a good time to be standing on that iconic south terrace. But let’s face it, with an atmosphere like this, is there ever a bad time? 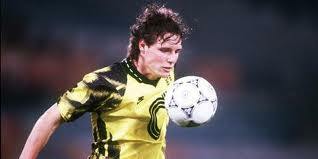 Saw Dortmund in that wonderful kit at Celtic back in the early 1990’s.